If you like historical art fiction, it doesn’t get much better than The Painted Girls, Cathy Buchanan’s new novel about the young ballerinas Degas used to paint and sculpt. Set in the seedy side streets of Belle Epoque Paris, this book tells the desperate story of three sisters who must find their way to survive in the dark world of the Paris demimonde. The Painted Girls is based on the true story of the van Goethem sisters who danced at the Paris Opéra in the late 1870s and early 1880s. They lived on the slopes of Montmartre on rue de Douai, and after their father died, they had to scrounge for a living as best they could. Although they were not classic beauties, the van Goethem sisters were talented enough to earn a place among the other novices, the “Petit-Rats” of the Paris ballet. But they still had to supplement their meager earnings with grueling jobs as laundry women or early morning bread makers. Soon, the younger sister Marie had a better opportunity. A regular at the opéra, Edgar Degas noticed skinny young Marie, the middle van Goethem sister, and asked her to model for him. She was honored to accept and relieved to earn extra money for the family. She was thrilled at the prospect of seeing her likeness at the Fifth and Sixth Impressionist Exhibits in 1880 and 1881. 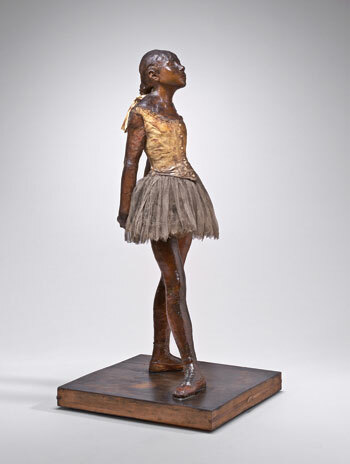 Little Dancer Age 14, Wax sculpture by Edgar Degas. NATIONAL GALLERY OF ART, WASHINGTON, D.C., COLLECTION OF MR. AND MRS. PAUL MELLON. Bronze copies were made after Degas’ death, including the one at the Musé d’Orsay in Paris. The modeling scenes are some of my favorites in the book. 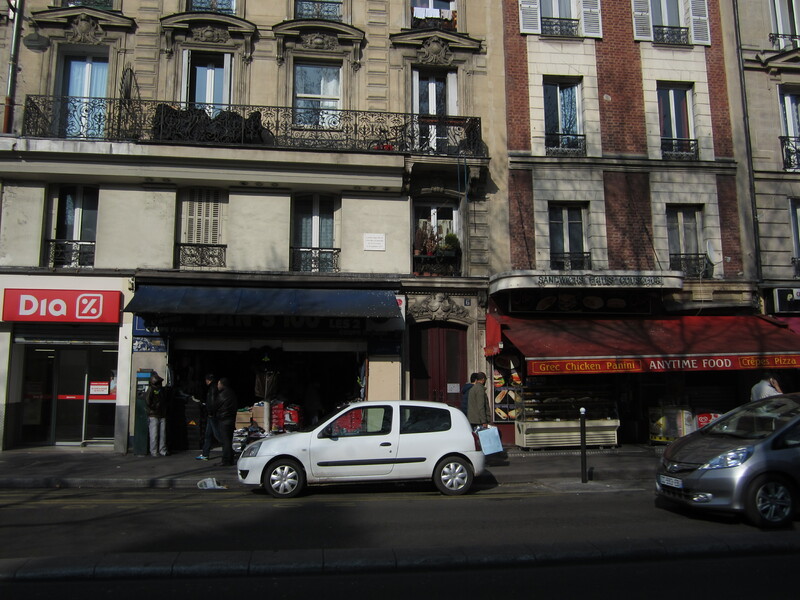 Degas’ studio on rue Fontaine was just around the corner from Marie’s home in the 9th arrondissement. It is in that studio, overflowing with canvases, paints and pastels, that Degas began the sketches for Little Dancer Aged Fourteen, as well as numerous charcoal and pastel sketches of young Marie. Cathy Buchanan’s website contains images of all of the artwork mentioned in the book. You can click on an image and read a related quote from the book. It’s just wonderful. But there’s so much more to The Painted Girls than pleasant little scenes in Degas’ art studio. In fact, there is very a dark side to the van Goethem sisters’ lives. The oldest sister Antoinette gets involved with a violent young man of the streets, and Marie is singled out by one of the wealthy older patrons of the Opéra known as abonnées. The reader knows exactly where Marie’s relationship with Monsiuer Lefebvre is heading, that such gifts and favors are never bestowed without a price. I want to put my face in my hands, to howl, for me, for Antoinette, for all the women of Paris, for the burden of having what men desire, for the heaviness of knowing it is ours to give, that with our flesh we make our way in the world. For there is a cost. . . . Would they say there is no cost, not so long as a girl takes no more than what a man decides her flesh is worth? Both sisters make troubling choices, and find themselves even more deeply involved in the demimonde of Paris. When Antoinette’s love interest is arrested and accused of murder, the sisters’ conflicting loyalties nearly tear them apart. Can their family repair the damage and find a way to survive the poor, dangerous streets of Paris, without having to trade what men desire? It’s an excellent read, although some might find the story drags a little during the criminal trials of Antoinette’s love interest, which could have been condensed down to one trial instead of two. However, that minor flaw still shouldn’t discourage you from seeking out and thoroughly enjoying this otherwise riveting book. And when you’re done with the book, go back and enjoy more Cathy Buchanan’s website where she has also posted photos from her Paris research trip. I couldn’t create a better literary tour myself! The Read: The Painted Girls, Highly recommended. 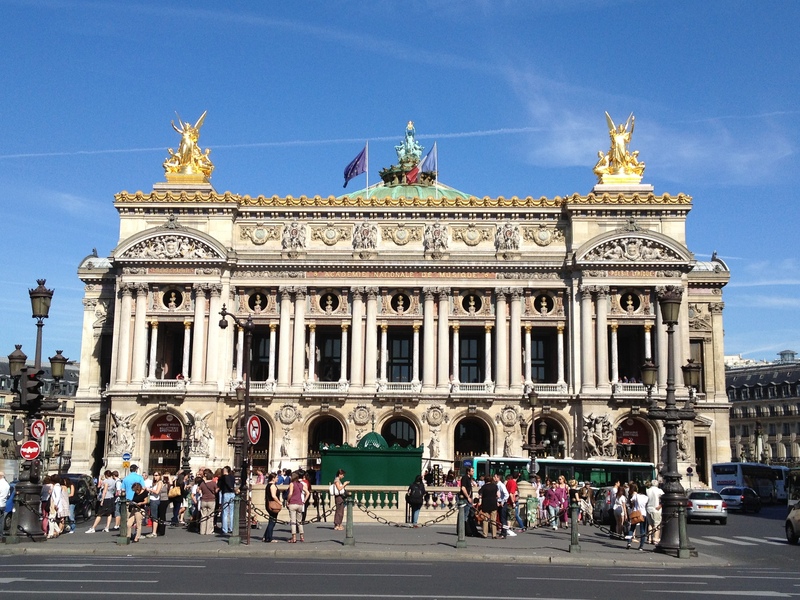 The Paris Tour: Take the Palais Garnier tour, a must-see in Paris. You can make an Unaccompanied Visit nearly every day, or an English Guided Tour available three days per week. 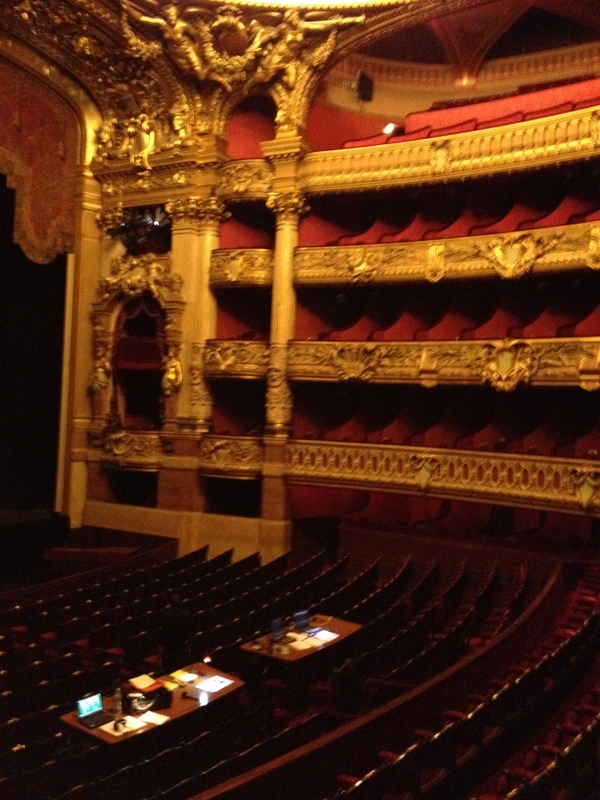 If you’re really lucky, you might be able to catch a ballet performance. Check out their 2012-13 schedule here. Then follow up with a visit to the Musée d’Orsay, where you can see one of the copies of Young Dancer, Age Fourteen, as well as one of my favorites, The Ballet Class. If you have the time to stroll through lower Montmartre, catch the Métro line 2 to the Blanche stop or line 12 to the Pigalle stop and browse through the van Goetham sisters’ old neighborhood. 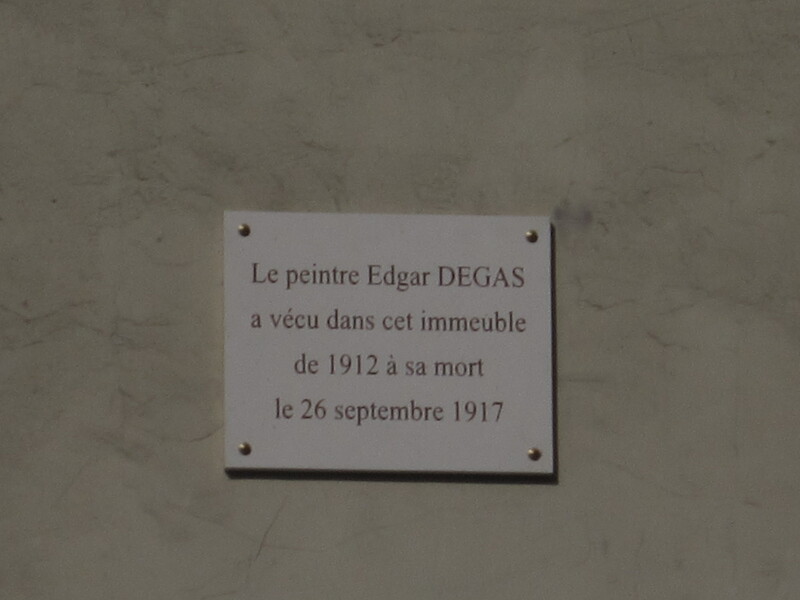 The last home of Edgard Degas from 1912-1917.